On Allah ruling, Reza and BFM tell Malaysian Muslims: "We laugh at you .."
Business FM 89.9 used to be one of my favorite radio stations because it used to be so good at being critical of the Government. Then one fine day it started to become a little too partisan for my liking. WIth the interview with Reza Aslan h e r e, the line is drawn for me. I mean, you can be as anti-government or anti-BN as you like but when you put a foreigner on air - even an award-winning one - so that be can laugh at our faith and thrash this country's judiciary system, you are not worth a dime. In doing so, I'm told that BFM has flouted the cardinal rule of public broadcast in this country. Under the terms and scope of operations, the radio station agreed that it would not insult or ridicule any race or religion in this country. I suppose by now the Malaysian Communications and Multimedia Commission would have analyzed the content of the Bible For Muslims interview. Let's see if MCMC boss Sharil Tarmizi has any idea of what he should do under such circumstances. Let's see if Information Minister Shabery Cheek has the political balls to act. Let's see if Attorney-General Gani Patail is consistent in his lack of tolerance towards any quarters who think they can insult this country's official religion and get away with it. As for the award-wininng Reza Aslan, not everyone is as impressed as the giggling dudes from BFM. Try reading Lies and Misrepresentations of Reza Aslan, for e.g. Reza Aslan's best seller No God But God came to me last year highly recommended but right from the Prologue, when he finds himself between an offended Muslim and a missionary couple on a train in Morocco, he comes across to me as not only ignorant but presumptuous, and therefore too eager to poke his nose where he shouldn't. There's a reason why I haven't been able to finish the book, I suppose. 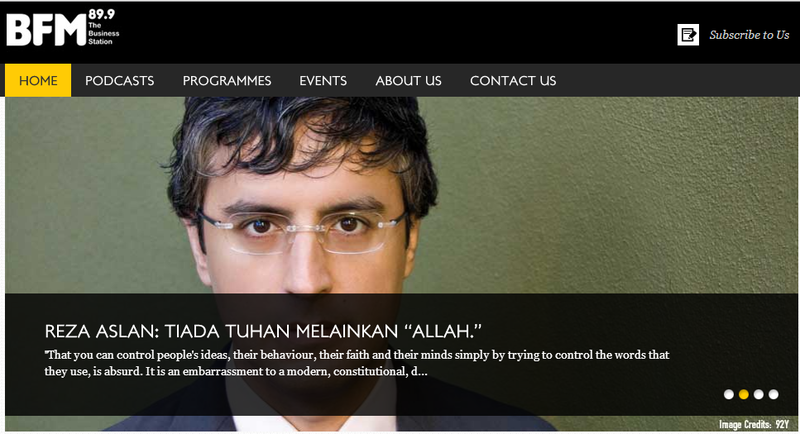 In the BFM interview, Reza Aslan somehow manages to come across as even more ignorant and presumptuous (or, in Melayu, bodoh sombong) about the Allah issue. I'd recommend Anas Zubedy's Can we use Allah in the Bible any time. Honest, not pretentious, educational. Rocky, kalau u dah bodoh, janganlah sombong pulak ! Dalam Malaysia ini ramai melayu macam reza.... tak solat tapi bercerita pasal Islam. Kata sat D, tak mandi junub, selamba je... kato oghang noghoghi, oghang camni suko beghak tongah jalan..ngabih an bogheh yo... "dungu semacam". Firstly Reza is a Muslim Theologian - so is not speaking in ignorance. Secondly he was not insulting his own faith - but pointing out an opinion of Malaysia's judicial ruling on the exclusivity of Allah and how outside peninsular Malaysia that Allah is applicable to all faiths who believe in the one God. Thirdly he was pointing out that Allah is an Arab word that predates Islam. Sabeery Cheek ? So many happening in radio and media including alternative media and he just look up to the sky. Truth be told, many are laughing and shaking their heads in disbelief. Another case of shooting the messenger huh. "I don't believe there is a heaven and hell where people who believe what I believe get rewarded and those who don't get punished. That's not a very sophisticated spiritual belief in my view." Says a lot about what kind of Muslim he is, doesn't it? When the Quran says over and over again that Hell is for those who reject Allah's message, this masuk-bakul-angkat-sendiri "Muslim scholar" says he doesn't even believe in it. It also tells us why he can be so flippant about this issue. Islam, Christianity, atheism, it's all the same to him. No need to protect the Muslim's faith because even if he becomes Murtad, there's no hell for him to go to. RE: "Reza is a Muslim Theologian - so is not speaking in ignorance"
"Lord forgive us for we have sinned against Thee in thought, word and deed. If you do not pardon our rebelliousness then we shall never ever see the light of Paradise, for you forgive all human follies but not the willful ingrate who imputes associations for Thy One and Absolute Sovereignty"
'...but when you put a foreigner on air'. Well I think I can stop reading after that. You are not worth a dime either. Theological Studies from Harvard Divinity School isn't exactly the equivalent of Islamic studies from Al Azhar university.So Aslan may not know everything about what he's talking about (even the American media think so). He should check the work of well respected and well known Islamic law scholars (among whom Aslan is not) such as Fazlur Rahman who was in 1969 the Distinguished Professor of Islamic Thought at the University of Chicago. In his book 'Major Themes of the Qur'an" (Chapter 1, pg 1), he refers to the term Allah as "the proper name for God" - in contrast with Aslan's misguided idea that it isn't - and Fazlur Rahman should know. Other than being respected as a legal scholar, he also did Arabic studies. If local Christians want to invoke the term Allah because it's a term which predates Islam, then the Christian god would be the one of the pagan gods of pre-Islamic times because that was what the pagans called god. Of course the Christians should know better what they get themselves into (we hope). No wonder peninsular Malays are confused. We are not pagans and do not refer to one of the pre-Islamic pagan gods as God. The Arab Christians also refer to elah and elohim as the One God and the false god, interchangeably in their bible. (In Exodus 3:13-15 God asked to be referrred to as YHWH - so how come God = Allah in Malay bible?? It is confusing to the Malays!!). The Muslims, on the other hand, refer to only the One God as Allah. This Reza Aslan guy is a Iranian-American Shia. So his views should be treated as a hostile non-muslim view. As for his "award winning" title...looks at who is the awarder. I rest my case. "Q: Are you still a Christian? Reza Aslan: No, I wouldn’t call myself a Christian because I do not believe that Jesus is God, nor do I believe that he ever thought that he was God or that he ever said that he was God. But I am a follower of Jesus, and I think that sometimes, unfortunately – I think even Christians would recognize this and admit it – those two things aren’t always the same, being a Christian and being a follower of Jesus." tak rasa pelik ke....cakap Muslim....ada mamatminah sini Muslim pastu mengaku follower of Jesus....apa Jesus ajar sama lu dalam Quran boleh cerita sikit? our universe is not like some of the political parties where father, mother and son (nepotistic practices) are allowed to hold the management posts and if that lead to turbulence just abandon the old one and create a knew one. This guy is an Iranian Muslim.Therefore he is aShaitt.A deviant Islamic group. His knowledge in Islam is nil.I mean sunni muslim.God have 99 names and Allah is one of them.All the name are mention in Quran. I was suprise the Business FM can air his view and make a fun of it.This is more serious the the Border Book store who was charge by Jakim by selling Islamic book not approve for circulation. Let see what Jakim going to do. In the same television program, Horowitz claimed that the Prophet Muhammad called for the “extermination of Jews,”. This so called scholar dulu lari dari Iran pi US. Lepas tu murtad jd evangelical christian. Lepas tu blk pd Islam balik. Kawin dgn perrmpuan evangelicdl christian. Yiu can check out wiki on this guy. Org mcm ni depa panggil scholar? Haha. We can now laugh at him. satD asking to check glen beck expose..next you will be asking us to watch fox news and sending donations to the tea party.you are one sad monkey.
. As a point of comparison to the dreaded Communists, Beck mentioned Islamic terrorists, saying he suspects that close to 10 percent of Muslims are terrorists. There are 1.57 billion muslim so 157 million muslim are terrorists. Who is going to sue this Reza Asian guy? The US courts would most probably throw out any such suit. And I'd be careful about branding Shia Muslims as this and that. After all, you wouldn't want one of the Ayatollahs taking potshots at Malaysia, would we? He's right about one thing though. There's more to this than just a matter of religion.